It’s another groundbreaking moment for Beauty and the Beast – the film is to feature the first interracial kiss in a Disney live action film. 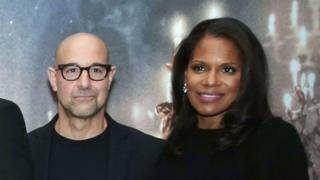 The romantic tryst will be between new character, the piano Cadenza (Stanley Tucci), and Madame de Garderobe, the wardrobe (Audra McDonald). It is followed by a second kiss later on, director Bill Condon told BBC Radio 4’s Front Row. This week it was revealed the film features Disney’s first gay character. US actor Josh Gad plays LeFou, a sidekick of the film’s main antagonist Gaston (Luke Evans), to whom he is attracted. Speaking to Front Row’s Samira Ahmed, Condon said of the two kisses between Cadenza and Madame de Garderobe: “I didn’t give it a second thought, then at the preview, the [Disney] chairman told me that it was the first and second interracial kiss in a Disney movie. The film, which will be released on 17 March, stars Emma Watson as Belle, the young girl who falls in love with a monstrous beast – played by Dan Stevens – with a dark secret. The cast also includes Ewan McGregor, Gugu Mbatha-Raw and Kevin Kline. The animated version of Beauty and the Beast came out in 1991. There have been interracial kisses in animated Disney films before, such as Pocahontas. Hear the full version of the interview with Bill Condon on BBC Radio 4’s Front Row at 19:15 GMT on Wednesday 15 March.